With a love for both helping others and digital creativity, Stephanie Tedesco never knew how to combine her two passions. But then she found herself on the southern edge of Alaska filming people for a documentary that would help share their culture, their hopes and fears, their story. It was like the magic at Disney World; behind the lens of a camera, Stephanie had found her solution. Walking along the Kuskokwim River, Stephanie couldn’t help herself from taking pictures and documenting the entire trip. 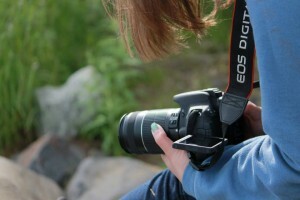 She was attached to her camera, discovering the best angles and lighting to capture the moment in. Stephanie, viewing the world through her camera. Photo credit to Leah Renaud. A group was talking about the different jobs required of us during interviews and how difficult some of them were. Stephanie shared her hopes for the trip, saying, “I want to try everything at least once: interviewing, holding the audio equipment, running the cameras. When else am I going to get this opportunity?” She was determined to step out of her comfort zone to get the most experience out of the trip. Stephanie was one of 16 students who had the opportunity to travel to Bethel, Alaska to create a documentary and share the story of the native Yup’ik people. The program she was a part of, Creighton Backpack Journalism, aims to teach students what goes into creating a documentary while also exploring theological aspects of the native culture. 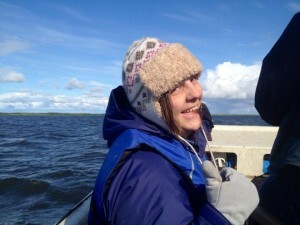 Stephanie on the Kuskokwim River. Photo credit to Leah Renaud. Photography has had a place in Stephanie’s heart since early childhood. “I’ve just always liked taking pictures,” she recalled. Then in high school, she was able to take a design course to explore design concepts. Now at Creighton University, Stephanie studies both Photojournalism and Graphic Design. When Stephanie heard about Backpack Journalism, she didn’t have to think twice about signing up. “It was something I definitely wanted to do,” she remembers. An opportunity to travel and practice what she loves was exactly the type of study abroad experience she was looking for.